Stevia rebaudiana is a small plant native to Paraguay and Brazil. In 1887, its usage was recorded by a natural scientist named Antonio Bertoni who learned of the herb from the Guarani Paraguayan Indians. The Guarani Paraguayan Indians traditionally used Stevia rebaudiana to flavor bitter tribal beverages. Two French chemists named Bridel and Lavieille began to unravel the secret of Stevia in 1931 with explatory extraction work on Stevia rebaudiana leaves. Their research yielded a pure, white, crystalline compound they named "stevioside" which is responsible for Stevia's flavorful properties. Inulin is a fructooligosaccharide derived from chicory. As a prebiotic, it stimulates the growth of friendly intestinal flora to support good colon health. It has a low glycemic index making it suitable for persons on certain types of restricted diets. Chromium is a trace mineral that is significantly reduced in the American diet due to the over processing of our foods. It is involved in a number of important bodily functions and is an effective synergist for Stevia and Inulin. 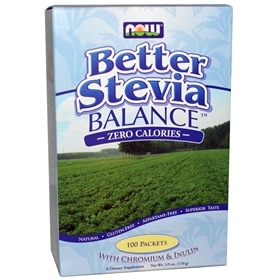 Stevia stabilizes blood sugar levels, helps insulin resistance, may even promote insulin production by promoting the pancreas health, discourage glucose absorption in the blood, and inhibit candidiasis, a yeast infection that flourishes when fed sugar. It has also been shown to inhibit the craving for sweet and oily or fatty foods. Other studies have shown that the antibacterial properties of Stevia may help with gingivitis, cavities, tooth decay and mouth sores, and suppresses the development of infectious organisms in the gums and teeth. Stevia also inhibits the growth of plaque and improves overall oral health. People who have used Stevia as a mouthwash has reported significant decrease in gingivitis, bad breath, bleeding gums, and other mouth infections.